[Solved] TopSolid'Wire too hard to use? Is there anyone out there that is actually using top/wire? My VAR told us it was too complicated and he sold us a seat of alphacam instead. I'm just wondering... because I think TopSolid'Wire should be a good piece of software. Thanks for any info everyone. 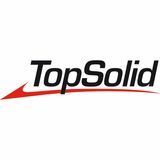 TopSolid'wire is indeed usable. It takes a good amount of upfront configuration, but after is a very powerful application. If you want to stay integrated with all of your programming, then it is indeed a great solution. If you like, post some questions about the wire product and I will do my best to answer them. I think that your VAR is wrong, TS'Wire is a very powerfull application an the logic of this module is the same than TS'Cam, but easier, if you are usign RS'Cam, to learn TS'Wire will take just 1 day for you, I think that your VAR don't know the product so much.